South Africa is the land of great “whites” and Great Whites. It has fun-spirited people, intriguing history, thrilling adventure sports and unforgettable scenery. When you think of South Africa, do you imagine a safari? Photographing herds of elephant and adorable playful leopard cubs? Bundling under a big fleece, warmed by a hot water bottle and your wide-eyed anticipation, as your guide stealthily manuveurs your jeep in the pre-dawn light down the savannah trail, tracking the lion pride! These safari experiences are just the beginning. ~ Travel the Vine Hopper and get a taste of South Africa’s famous wine county. ~Sail a schooner out of Victoria and Alfred Harbor and into the glowing Cape Town sunset! ~Visit one of the 12 indigenous tribes, and even sleep over. ~Adventure! Abseil off of Table Mountain, dive with the Great Whites, go sandboarding and caving. ~Visit UNESCO’s Cradle of Humankind, where the oldest hominid remains on our globe are being unearthed. It is just one of SA’s 8 UNESCO World Heritage sites. ~Volunteer on a real farm, join a research project, build a playground, or help out at the Lion Project. ~Appreciate “The Struggle”, through the Apartheid Museum of Joburg, the Robben Island prison off of Cape Town and an insider’s tour through Soweto, guided by a woman who grew up there and became Woman of the Year! ~Kayak with whales and hike the waterfalls of the magical Garden Route! ~ And love the music. You can go into the home of a local musician in Cape Town and listen to him jam with his friends! 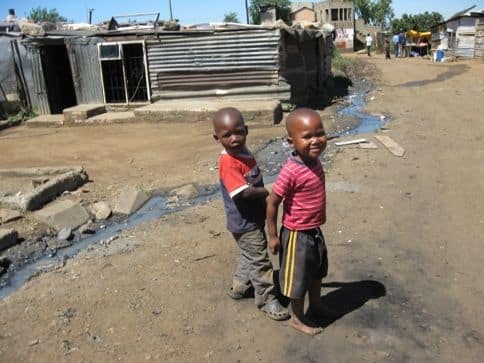 You’ll hear DJs spinning African hits at the local shabeens, jazz on the sidewalk, and wonderful outdoor concerts at the “informal settlements”. Or just luxuriate in Cape Town! 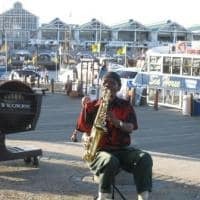 There are trendy stops along the café-strewn waterfront, and also hidden lunch spots, buried deep in the wharf’s old-school fishing culture. You can spend mornings ambling along the clifftops of Table Mountain, later strolling the downtown’s outdoor farmer’s markets and museums, ending up in Long Street’s hopping bars and artist studios! Make sure to take a day to explore the picturesque Cape drive which takes you to one of the only mainland penguin colonies in the world, and the southernmost point — the Cape of Good Hope! 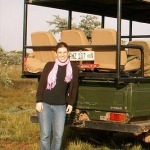 Contact Melanie for information on planning an authentic South African adventure! Would you like a FREE REPORT on choosing the perfect safari: Don’t Get Bushwacked on Safari! Would you like to explore more destinations? “Truly a phenomenal experience. I can’t thank you enough!